The protected Gadai Forest of Tamenglong which is also known as ‘Prayer Mountain’ is slowly losing its beauty despite efforts by concerned forest lovers to preserve the mountain to its natural beauty with dense forest. Trees were enormously cut down by some individuals for firewood purposes and jhuming cultivation. With an aim to protect the Gadai forest for water resource for Tamenglong town, the Town Churches Union Tamenglong had erected huge cross on the top of the mountain and gave its name ‘Prayer Mountain’ and planted tree saplings every year and cleaned the jungle. Moreover, Rain Forest Club, Tamenglong headed by Tamenglong DC planted tree saplings on World Environment Day last year. The district administration sealed the trees and had counted in the Gadai forest and issued an order to stop felling trees. However, all the steps taken to protect the forest to get sufficient water for the district have gone to futility. It may be mentioned here that the district administration together with forest department had sealed pine trees with numbering last year. 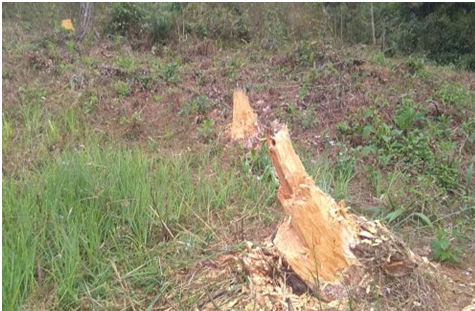 But no follow-up action has been taken till date and many trees were felled for jhuming cultivation and firewood. When this correspondent explored the forest today to inspect the present status of the forest, it is found that pine trees were enormously cut down in many different places and many trees are felled without authorization. Jungle cutting for jhuming is seen just below the “big cross” some 50 to 70 feet while on the other side 200 feet away from the sign board, felled cuttings ready for burning were also seen. In the meantime speaking to this reporter, an environmentalist and Wild Warden Tamenglong and also chief medical officer Tamenglong, Dr. Chambo Gonmei said “we are conscious for water Tamenglong town, water is life. If we do not preserve the forest for future younger generation, there won’t be anything left”. The protected forest would be vanished in no time or sooner if the concerned department and district administration of Tamenglong do not act in time.